Though India is yet to see the launch of its first REIT, introducing this investment vehicle can create a vibrant market for commercial real estate. Rajeev, aged 40 years, has a well settled job and a stable investment portfolio comprising equity shares and mutual funds. Apart from his routine investments, he has been able to accumulate an amount of 15lakh to 20 lakh which he wants to invest in a long-term asset. He has lately been reading about demand from multinational corporations (MNCs) for leasing commercial office space and complexes. He wants to invest the money in commercial office space so as to reap benefits of the increased demand of leasing commercial space from MNCs. However, a standalone budget of 15 lakh to 20 lakh is insufficient to buy such an asset so Rajeev has no other option but to continue to put these funds in his existing portfolio of equity shares and mutual funds. SEBI notified the REIT regulations in September 2014. REITs are trust vehicles which can raise funds from investors, acquire rent-yielding real estate, manage such real estate and distribute all of the income to investors. The concept of REITs was first introduced in the 1960s in the United States and then in other developed countries like Singapore, Japan and Canada. REITs are functionally similar to mutual funds - they pool in the investments of many individuals and institutions and then put in this money in real estate assets. Thus, REITs as an investment class provide the common man an opportunity to invest in fixed income securities which also provide long-term capital appreciation and a natural inflation hedge. It also opens to small investors an arena, (rent-generating real estate assets) hitherto the monopoly of large investors. As compared to a conventional investment in a real estate asset, investing in a REIT provides an investor much needed transparency and hassle-free access to a portfolio of assets, thereby ensuring that an individual does not become a victim of foul play by some developers. Some of the key regulations imposed by SEBI which make REIT well-regulated and investment-friendly are: Compulsory distribution of 90% of net distributable income earned by REIT to its investors; Specific norms in respect of portfolio of assets which can be held by a REIT; such as at least 80% of the value of REIT to be invested in completed and rent-generating properties Full and transparent disclosure of transactions with related parties Norms in respect of appointment and independence of valuer have also been put in place Audit of accounts of REIT to be done for not less than two times a year Well laid set of rights and responsibilities of unit holders, investment manager, trustee and valuer, etc. Although India is yet to see the launch of its first REIT,the introduction of REIT is expected to create a vibrant market for commercial real estate in India. REIT has the potential of offering a perfect investment opportunity to small investors. It has democratized real estate investment by giving all investors the ability to invest in the real estate sector and gain the same benefits. We have listed below some of the benefits offered by REITs: Indian tax laws provide for beneficial tax regime for REITs and its investors, in line with the global standards; Ensure regular inflow of income with capital preservation and appreciation; Offer a natural hedge against inflation as commercial real estate rents and values have a tendency to increase when prices increase. This has supported REIT dividend growth, providing retirement investors with reliable income even during inflationary periods; Offer easy exit opportunity and liquidity to investors; Provide developers with an alternate source of raising funds from public; Convenient way to invest in real estate assets instead of the conventional way which involves the tedious task of undertaking proper due diligence, completing property related regulatory formalities, etc. Assist in streamlining the real estate sector by removing investment gaps. In spite of the fact that Indian markets have not seen practical application of the concept of REIT, still theoretically, investment in REITs is quite an easy and transparent process. SEBI regulations require units of REITs to be listed on a recognized stock exchange allowing easy trading of REIT’s units. An individual can easily acquire the units of REIT from the stock exchange. SEBI regulations also provide that minimum subscription by each investor shall be merely 2 lakh with a minimum trading lot of 1 lakh. 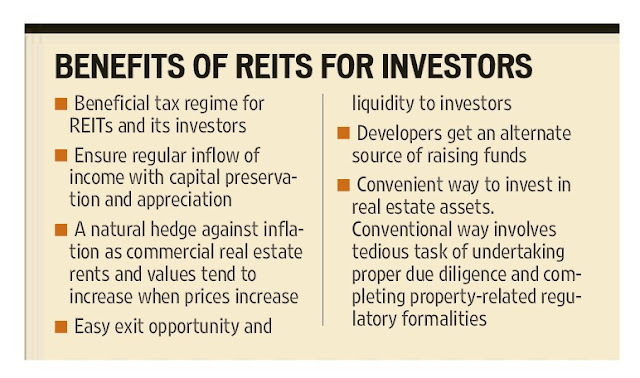 Estimating any range of return from a REIT at this stage may sound like an early shot from the gun, however, it would be interesting to see if REITs as a vehicle are able to perform in the Indian real estate market and provide good post tax returns to its investors. The author is a partner and national leader - real estate practice, EY Abhishek Arora, senior tax professional, EY also contributed to the article.